You may not be aware of Freud's text 'Delusions and Dreams in Jensen's Gradiva'. In this essay, in his usual microscopic style, Freud analyses Wilhelm Jensen's 1903 novel Gradiva, trying to tease out the latency inherent in the text-as-dream. Being quite familiar with Freud, I hadn't considered him from a psychogeographical perspective until this essay was referred to me by one of my thesis supervisors. Here Freud psychoanalyses the behaviour of the protagonist of Jensen's fiction, Hanold. 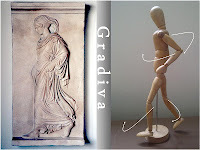 Perhaps his interest in the novel was sparked by a relief he had of Gradiva in his office (latin translation: the woman who walks), which you can see in my picture above. 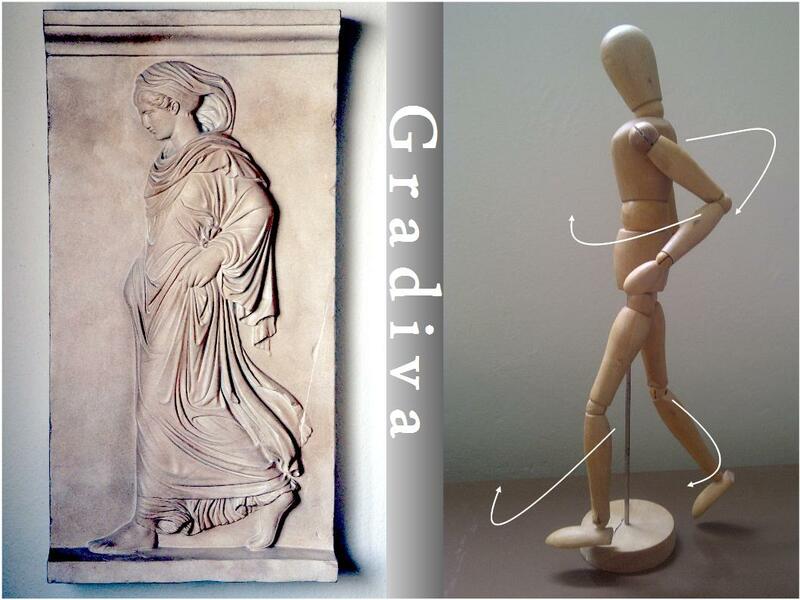 I have placed an image of the relief next to a photograph of an artists' mannequin that I have attempted to stand in the same position as Gradiva. Freud is fascinating. He always reveals so much of himself when analysing others. The projections (obsessions) of Hanold's he comments on in this essay, could likely be compared to Freud's own. Freud saw the original Gradiva in Rome, had a copy of the relief in his Hampstead office and then wrote an essay about Jensen's novel. 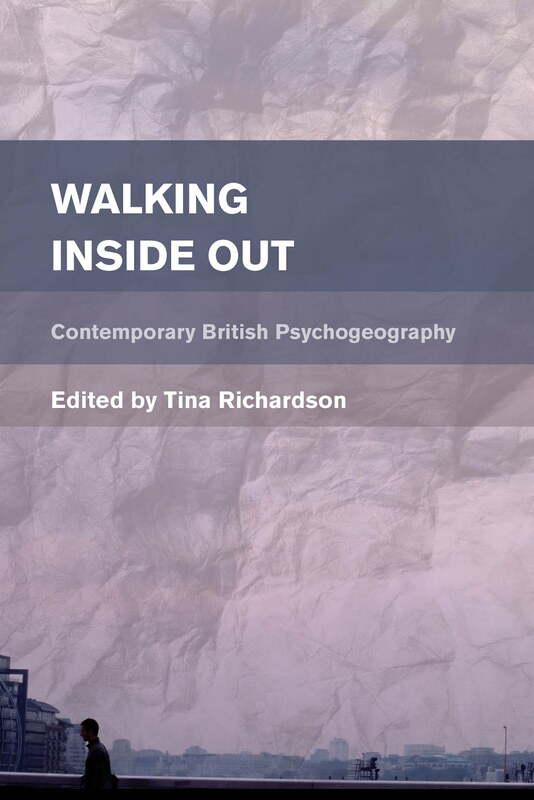 My second part of this blog will look at another 'psychogeographical' reference by Freud in The Uncanny. I will be providing my own analysis of Freud in this upcoming blog. The extracts of Freud's text are from Crossing Aesthetics edited by Werner Hamacher and David E. Wellbery (Stanford University Press 1997). Odette Dewhurst, at the University of Leeds, alerted me to this gravestone in the university cemetery, St George's Field. She found it in August 2011 and when I went there in February this year (2012) it was still there (see image below). 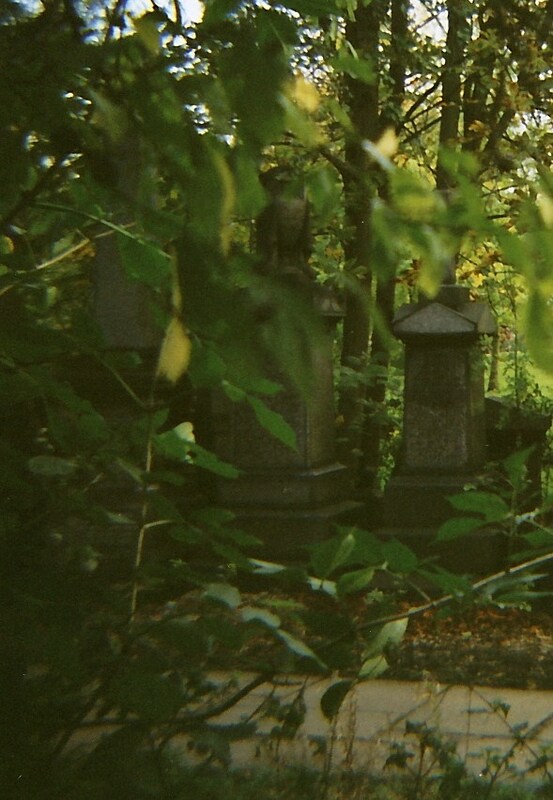 The gravestone is of a similar style to many others located in this part of the garden. It is not of a particularly impressive design and contains the words "IN MEMORY OF/ JAMES ROBINSON MASON OF LEEDS/who died March 15th 1840/aged 45 Years". With yellow and red chalk or pastel someone has drawn a flying (rising?) bird in an expressionist style, in a way that makes the bird look like it is taking off and moving upwards. Odette has called it a phoenix. I am not sure if it was the intention of the artist to be a phoenix, but it does look like one and the semiotic context (a graveyard, death, ashes) could suggest it is. This drawing is temporary: if it was not removed by anyone at the university (by estates staff or students), it would eventually be removed by 'the elements'. The artwork serves as a schizoanalytical action in that it incorporates both an "aesthetic production" and a "micro-political act". (Guattari 1998: 433) The artwork could also be considered in relation to the concept of death, providing one assumes it is a phoenix; but, also because of its situation in a graveyard. Félix Guattari poses the problem of the death instinct in relation to desire, explaining that in contemporary society with its dominant capitalist subjectivity, schizoanalysis enables the death instinct to be side-stepped by desire which then subjectively changes in differing situations. (1998: 72) For this reason the phoenix drawing could be considered the symbol that represents the presence of schizocartography actually taking place in St George's Field. The Situationist Raoul Vaneigem believed that for a true aesthetic of daily life we must all become artists in our negation of the death instinct in the way it was for Freud in the superego's submission to dominant individuals and structures. (2010: 95) This demonstrates that creativity does not have to be opposed to death but that, in a sense, they rise concurrently outside of any dichotomous relationship that dictates some inevitably destructive end. The creative instance of the phoenix drawing is something that we cannot temporally tie down exactly, since we do not know when it was created, nor who the artist is. However, we can examine it in regards to its moving away from dominant modes of representation and pose some questions around its reception. For example, is it an anarchic work of art? Could it be considered to be graffiti? And, if there were relatives of the deceased still living, and they liked the artwork, would either of the two questions be relevant? The question of aesthetics is not only posed in regards to the multiplicity of the subjectivities of the potential viewers, but we are also pointed in the opposite direction, towards the origins of the dead person in the grave, to their personal and familial history. This also draws our attention to the issue of alterity as it is for St George's Field; not only in relation to the paupers grave, none of which were properly spared in the 1960s landscaping, but also to the question of who decided which gravestone survived and which did not. Guattari, Félix.' Schizoanalysis', The Yale Journal of Criticism, 11, 2 (1998), 433-439. Vaneigem, Raoul. 2010. The Revolution of Everyday Life: An Illustrated Reader: Part 1 (Great Britain: Justpress). Guattari, Félix. 1995. Chaosmosis: An ethico-aesthetic paradigm. Trans. Paul Bains and Julian Pefanis. Bloomington and Indianapolis: Indiana University Press. The chapel at the centre of St George's Field has an undercroft - or columbarium (a vaulted storage space, usually used for cremated remains) - which is no longer accessible from inside or outside the chapel. Despite this, on 23rd June 2011, during a Leeds Psychogeography Group walk, it was discovered that the outside 'wall' of the undercroft had fallen down in one place, revealing the inside. The particular dérive that Leeds Psychogeography Group were on that day was organised on the University of Leeds campus, and took us to St George's Field. One of the members of the group mentioned the undercroft and we decided to explore it, discovering on our arrival that one of the walls had fallen down in one place, revealing the inside. Near the entrance, on the inside, was a plaque. Unfortunately, we did not photograph the plaque or record a dictation of the text appearing on it at the time, hoping to return at a later date with the appropriate equipment. However, when I returned it had been closed up, by replacing the bricks with new mortar. Mystery solved. Our maintenance guys have blocked off the undercroft in recent months with stonework and railings to prevent access from outside by 'undesirables'. They confirm there is no access from inside the chapel and thus there is now no access in to the undercroft. They did take photographs of the plaques in the undercroft before they closed up BUT they were of such poor quality they didn't keep them. Sorry but it seems the plaques are locked up forever! The above quote is an example of how hiding works in postmodern space in a response to administrative decisions (however, it is important to say that the original bricking-up of the undercroft goes back to the 1960s). But, also it is apparent that there are certain 'types' of people that are not welcome in the garden (the scare quotes surrounding 'undesirables' is part of the original email). One of the most troubling aspects of this closing of the undercroft is that it is now a piece of lost social history, since neither the Estates Office, nor Leeds Psychogeography Group, have the full information from the plaque. Also, while it is not clear what types of 'undesirables' are being referred to here (perhaps homeless people or maybe just inquisitive students), the space has been defined as a place that includes some people and not others, and these exclusions will involve those who are deemed not to be 'fit' as part of a wider notion of how the university should appear. But despite this, the (re)discovery of the undercroft by Leeds Psychogeography Group provides a good illustration of how desire operates within the "subject-group". For Félix Guattari subject-groups are the opposite of subjected individuals or groups, in that they are groups or individuals who are not taken over by dominant systems of power, for example, the super-ego, or political power such as capitalism (2008a: 471). They form a line of flight which is able, in the moment, to traverse temporal and spatial boundaries at the same time bringing to light a piece of social-history which is buried within the territory. They momentarily create a new space in response to the subject-group currently in attendance in the territory, accounting for their collective modus operandi, but also through their individual affective reactions. Guattari calls this process "transversality", which is a particular form of communication forming a bridge that takes unconventional routes between systems. (1995: 23-24) For Guattari these connections would not be dyadic (dialectical) nor triadic (Oedipal), and would, hence, operate outside of hierarchical power structures and semiotics. Guattari, Félix. 1984. Molecular Revolution: Psychiatry and Politics. Trans. Rosemary Sheed. Harmondsworth: Penguin Books. Guattari, Félix and Suely Rolnik. 2008a. Molecular Revolution in Brazil, trans. by Karel Clapshow and Brian Holmes (Cambridge, Mass and London: The MIT Press). Guattari, Félix. 2008b. 'The Life and Work of Félix Guattari'. In The Three Ecologies, trans. Ian Pinder and Paul Sutton, 46-78. London and New York: Continuum. Following on from my post Traversing Transversality, I would like to provide an example of schizocartography as it appears in the space of St George's Field, the University of Leeds cemetery. For her BA project in the School of Design, Charlotte Deponeo took casts of the text on the gravestones in St George's Field and rather than making further sculptures from these casts, the casts themselves were presented as the actual sculptures. 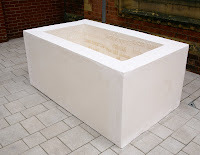 One sculpture was placed outside the cemetery, but still on the university campus, near the School of Design, where it could then be stumbled upon by accident: indeed a number of us from Leeds Psychogeography Group found it on an organised walk one day. The schizoanalytic process involved in the making of the sculpture also has the function of bringing the past into the present and, in a sense, de-mythologizing it. Guattari explains what is happening in these situations: “Existential Territories become diversified, heterogenised. The event is no longer enclosed in myth: it becomes a nucleus of processual relay." (1995: 105-106) The dominant order of the institution becomes momentarily translucent, its image fades away and other histories are momentarily made available. The concept of myth was also significant to the Situationist International. In their critique of consumer culture they saw the city as being a mythologised space representing the hollow sign that appeared in the form of the spectacle. This meant that the city could then become a place where private desires were then played out in the public domain in a consumerist form. (McDonough 1994: 76) Guattari's schizoanalytic cartography helps reveal the myth of controlling aesthetics and enables a space for subjective desires to come into play. Guy Debord sees the powers employed by capitalism in urban design as applying processes to space in such a way as it become homogenised. (2005: 165 and 171) The landscaping of the cemetery could be considered to have resulted in a homogenised space, losing (hiding) its 'real' character and separating it from its origins.